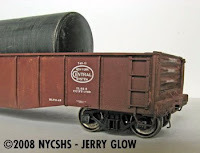 Jerry Glow is a Missouri Pacific modeler, but a fan of freight cars of all roads. Jerry presents his model of a Pittsburgh & Lake Erie gondola with pipe load. This very simple project required substituting ladders from his scrap box for the grabirons on an otherwise stock Proto 2000 kit and a little touch up to the paint. He has yet to weather the trucks, add couplers and tie-downs for the load. Not all freight car projects have to be complicated! This entry was posted in NYCentral Modeler. Bookmark the permalink.